French Prime Minister Manuel Valls says UN cultural agency was wrong to describe Temple Mount as a Muslim site. French Prime Minister Manuel Valls on Wednesday described a UNESCO resolution which described the Temple Mount in Jerusalem - Judaism's holiest site - as a Muslim site as "clumsy" and "unfortunate" and said it should have been avoided. The Paris-based UN cultural body adopted the resolution on "Occupied Palestine" presented by several Arab countries in mid-April, referring several times to Israel as the "occupying power". "This UNESCO resolution contains unfortunate, clumsy wording that offends and unquestionably should have been avoided, as should the vote," Valls told parliament. Vall's comments follow a similar objection by France's Interior Minister Bernard Cazeneuve, who said the resolution "should not have been adopted." France representatives at UNESCO did vote for the resolution, however. 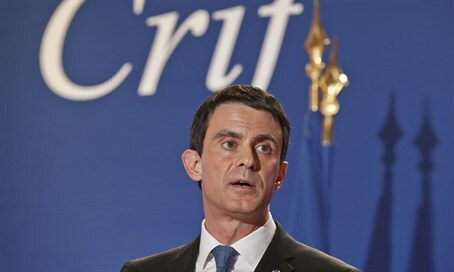 Earlier Wednesday, Valls confirmed he would be traveling to Israel at the end of May, to promote a French-led initiative to revive peace talks between Israel and the Palestinian Authority.